The veggie garden in early July, was just perfect. Everything was just picture perfect, right sized and tidy. 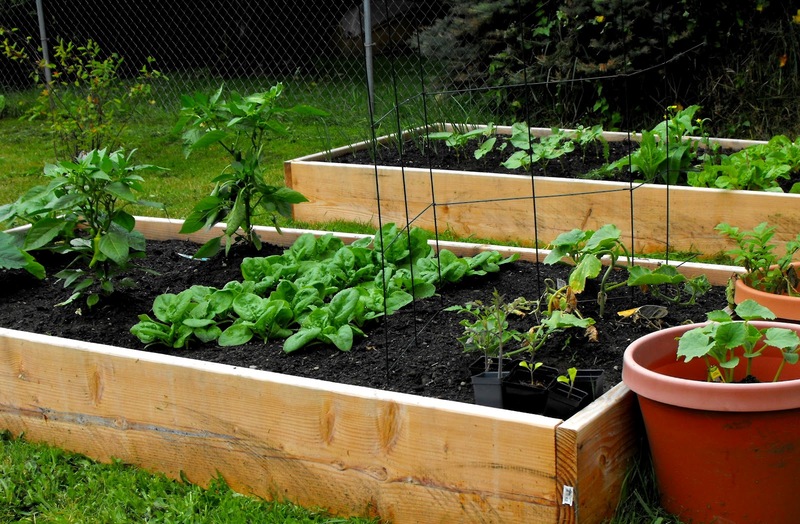 Spinach, beans, peppers, tomatoes, onions, potatoes, lettuce, pumpkins, swiss card, squash, carrots, zucchini and cucumbers. We have enjoyed multiple pickings of the summer spinach. It's time to pull it now and think about planting something in it's space for fall harvesting. We counted seven, sugar pumpkins so far. What summer garden would be complete without buckets of zucchini? Yah, I've got that covered. My next project will be to trim back my tomatoes. 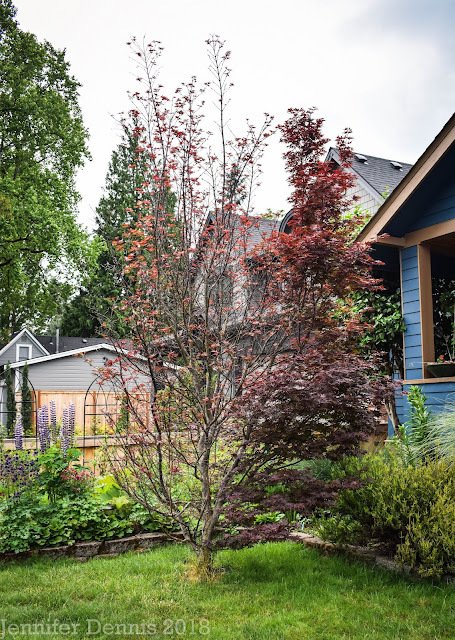 As I was working back in my raised beds, taking a break from the ongoing home remodeling projects in the house, I felt a little bit of zen. 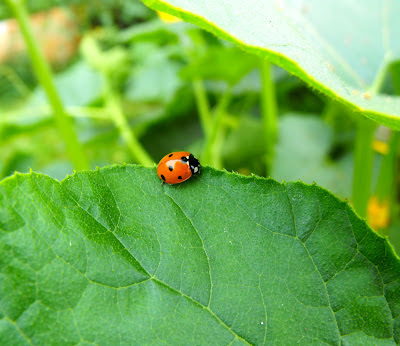 Birds were chirping, bee'z buzzing..pollinating my plants, a slight breeze and many a beneficial bug were hanging about. It all lovely and lush Jenni. At least you had some squash for your husband to squash! 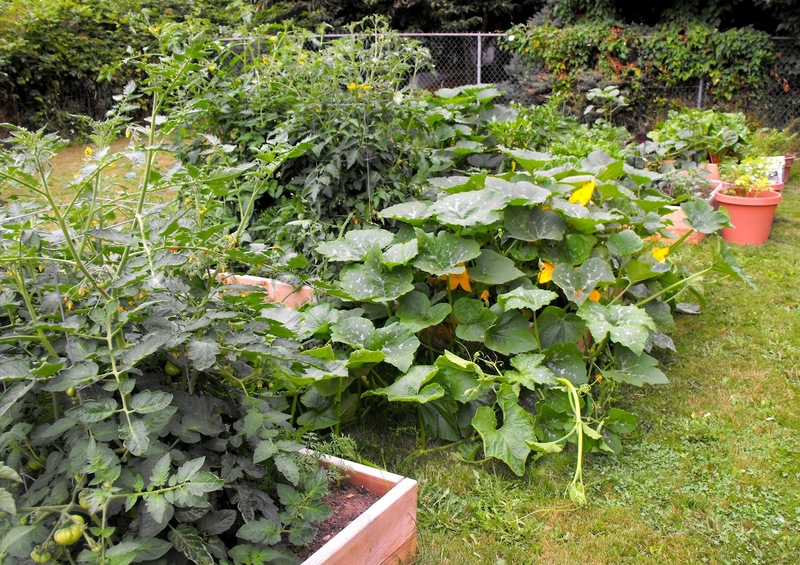 Beds that would usually contain pumpkin and squash are bare on our plot this year. Sue, my pumpkins really suffered last year due to the cold and late start to summer. (Aug 1st or thereabouts). This year, it's been warmer so, good results on the pumpkins, but the heirloom squash isn't doing too much yet except making vines. I'm holding out hope you'll get some warm weather yet. I cannot seem to get my squash to take off like that. In the past I've gotten one or two zucchini and then they peter out or succumb to fungus. They're beautiful. It's so pleasant when everything is thriving like this. Alison, my heirloom squash is growing but no babies yet. Lot's o vines. It really hasn't been consistently 'hot' yet. I've been surprised to see a few cucumbers on the vine. I had 1/2 of one last year due to the cold. Wow!! So awesome!!! I keep slugging along with veggie gardening but flowers seem to be more in my wheelhouse. It turns into a jungle so quickly! I can't even find my paths any more, and have to try to tiptoe through all the different vines and try not to step on them. My squash wants to come through the fencing and onto the lawn, and my husband says he'll mow them down if they do. They just don't get it! Haha Granny, no they don't! I tried to explain that I needed (especially on the heirloom squash) more vines because no female flowers had bloomed yet. It is jungle time! 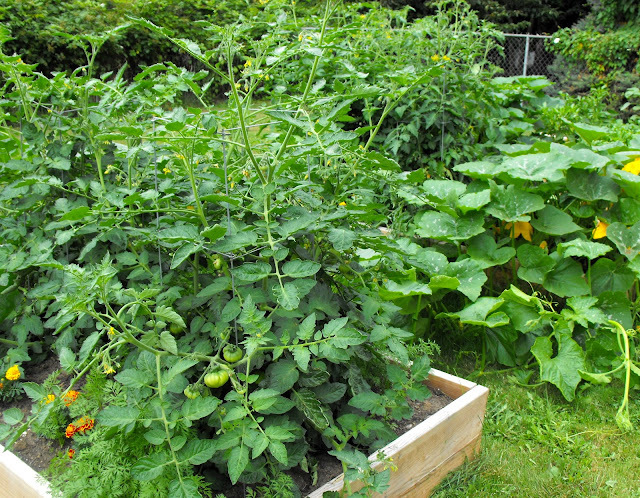 Jenni,I have not planted near as much as I did last year, and still I have plenty of veggies to feed us. Your garden sure looks wonderful. Wow, everything really took off didn't it!!! Sounds like you've had a brilliant harvest so far. Now about picking up those vines when you're mowing around the vegie garden ... that can be time-consuming you know!!! Much easier just to run over what's ever in the way! At least that's what my hubby said. Your veg box plants look to be thriving, wish I could say the same for mine. Looks like a big success your way! Hope you get lots of great harvests over the summer. A moment of zen is always good especially when you're in the throes of indoor projects. I'm glad you're enjoying your bountiful garden. I love that little lady bug shot. I bet your kids did too. 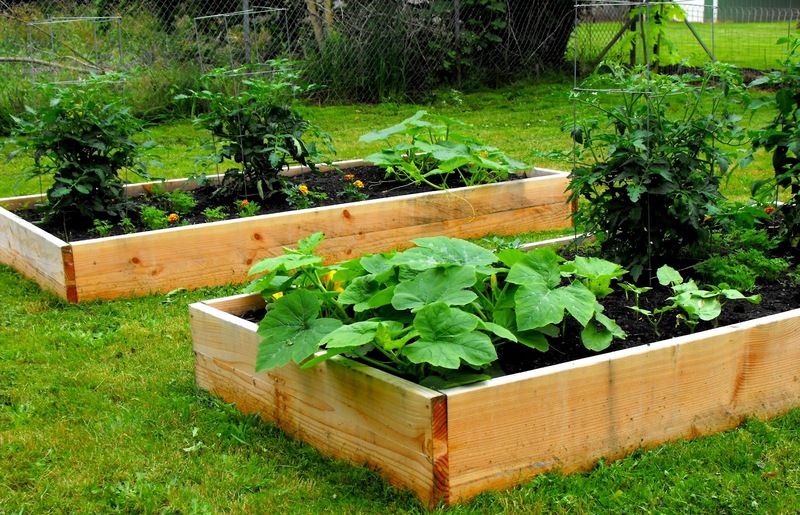 I really like those raised beds,call me goofy,but,i have been looking at different blogs to get an idea of how we want our garden setup.Those are pretty and functional.we'll have at least 8 to 12 to put in when we get back home.Yeah I'm planting a fairly good size garden next year.Ya'll do good work.